It's the end of June. Do you know where your pension is? It's the end of June which means it's the end of the quarter and folks will soon be looking at the latest returns on their mutual funds. Same goes for the city's pension system which will have new numbers as well. Over the last 3 months nobody is going to have done well. DJIA is down ~9% since the end of March. After the first quarter's pension fund performance there was this important news that connected the dots between the pension fund's recent performance and the upcoming parking asset monetization. Basically the worse the state of the pension fund, the greater $$$ needs to come from the parking assets for it to be worth doing at all. As the story pointed out, already from March data it was obvious that the city needs more than it was originally planning on. What will the iteration of that news story say when we get data from the pension funds' 2nd quarter performance? DJIA actually went up a few percentage points over the course of the 1st quarter. That does not bode well for how the pension funds did in the 2nd quarter when the DJIA actually plummeted. Normally the city wouldn't make the pension fund data available for roughly 6-7 weeks after the end of the quarter ... which would be later in August when the pension board meets. I have a feeling that since the city for a limited time has a vested interest in making known the dire state of the pension system, so as to facilitate less resistance to the parking asset monetization, it may give us the bad news a lot sooner. Building a Better Bloomfield? Let's ask Jane. Distant readers can just pass on this, but there is a theme today in my e-mail inbox. Here in Pittsburgh one of the bigger pieces of news, economic or otherwise, is that there will be a major consolidation of hospital services in town. My synopsis is that there will (very) soon be a major downsizing of West Penn Hospital in Bloomfield where I was born and raised for the most part. In fact it all sounds to me like an interim step toward a more complete closure, but that is speculation on my part. It's all major piece of news for a region that has been advertising a resurgence based on "Eds and Meds", but also for a neighborhood. But the big regional economic story in this we will leave for another day. For the moment the question is what the impact will be on the neighborhood and the city. For sure, this isn't the case of Braddock where the closure of a hospital will mean drastic changes in where nearby residents can get health care. In fact I was born in St. Francis Hospital, which was within walking distance of West Penn. Yet even with effectively two fewer hospitals than once existed in the neighborhood, there is no lack of health providers in close proximity. The St. Francis site begat the ever-larger Children's Hospital and there exist several hospitals within a few miles of the neighborhood. So is it a big deal? Sure. Especially for the workers themselves which may see their jobs 'downsized', a word with remains as silly a euphemism as when some management consultant dreamed it up. * For the area around the hospital it gets more complicated. What is coincidential is that in the WSJ today is a diatribe of sorts against the philosophies of the late Jane Jacobs, sage of all things urban. See: Enough with Jane Jacobs Already. What is fascinating about that opining is not that it opposes Jacobs' philosophies, but that it highlights just how much more following and support she has today than ever before. It has been nearly 50 years since The Death and Life of Great American Cities was published. Trust me there are a lot of things written 50 years ago that have not been heard about for the last 49. What's Jane got to do with it? Jane Jacobs own writings many years ago were not fond of the community impact of large hospitals much as she was not a fan of how many large institutions interacted with their neighbors. Her experience, which included being a 'hospitals and schools' editor for Architectural Forum magazine, gave her a long perspective on the impacts of hospitals. Her consistent observations were that most large hospitals were essentially isolated enclaves that more often than not did little to inhibit blight in nearby neighborhoods. I myself wondered if that part of Jane's thinking was still valid today. Hospitals must be big and good right? We're smarter about how large institutions interact with the community I was pretty sure. Some of that may be correct, but what got me back to Jacobs' core point was observing the economic impact of the relocated Children's Hospital in Lawrenceville which is a lot less than many think; especially when it comes to nearby retail activity and invesment. The areas closest to the relocated hosptial have not had much of what anyone would call a revival as yet. It's not a critique on the way the hospital is run, or of the way West Penn operates in Bloomfield. It is hard to integrate such large insititions into neighborhoods. In fact many of the forces driving large institutions to be 'efficient' force them to be ever more self-contained and isolated than in the past. So I am not sure the impact of West Penn on the neighborhood is as large or as positive as I think many presume. My point is merely is that it's not all good or all bad when you consider the gain or loss of a large institution like this. Nonetheless, the footprint of West Penn Hospital is a nontrivial piece of real estate for a neighborhood, if not for the city. I fear what may be the true legacy of things like the Mon Fayette Expressway. Build it or not, the impact of a perpetually hypothetical project of that scale has inhibited a generation of potential investment in the communities slated to be paved over. Likewise if this is all a sign of further downsizing at West Penn in the future then I wonder how potential investors will view the potential of the immediate environs. Clarity is the most important thing for the neighborhood to plan it's future with or without the hospital. What it means is that a clear vision of the future is needed from the hospital. The City of Pittsburgh is right now working on a comprehensive plan for the city. What is happening to large institutions like this needs to be an integral part of that plan. Trust me that Bloomfield, the neighborhood, can deal with whatever the future holds for the hospital. What will make this all a lot more painful than it needs to be is uncertainty or vagueness going forward. I bet there are some suprising options for a Bloomfield without West Penn. The question is whether we need to start working on what those options will be. * You downsize a house, not a person's job. Don't get me going on 'rightsizing'? Harrisburg doings don't rise to people's attention unless things get really really bad, or involve large inflatable pigs, but some may know budget rumblings are ongoing. Technically speaking, Pennsylvania is required to pass a budget before midnight tomorrow evening. Funny that rarely happens. Last year they went 101 days past their own statutory deadline, but who is counting? Though I wonder about some of the Tax Foundation's simplistic metrics. According to this report of theirs from just a couple months ago Pennsylvania is listed as reassessing all real estate annually. Huh? I think that information is so misleading as to be effectively false. How many counties in Pennsylvania reassess property annually. We have counties that don't reassess every decade. I guess this map is better for the more current debates going on in Harrisburg. I'll leave it be on it's own, but also from the tax foundation. Might as well complete the trifecta. Here is their tabular ranking of how states compare in terms of combined state and local sales tax rates. A story out of Dayton: Australian man plans to return later to renovate house bought on eBay, and version 2 of the same story: Australian gets first look at Dayton house bought on eBay. I still wonder if there are any comparable stories here. The thing is I am not sure these auctions ever result in an actual sale and deed transfer. I have looked at a couple local real estate parcels that have clearly been listed for sale on ebay. Neither appears to have actually changed owners according to the county assessment system. So a real question if anyone has an answer... Are there any local real estate parcels that actually changed ownership via an ebay auction. Any that actually had deed transfers even, let alone someone take posession and move in? Bonus points if there is a new owner from Australia as in Dayton. Someone please ask Reg if I get the idiom right. Thus I am obligated to point out our last post here on all things Troutonomics. Which was all just to point out a link to the great cult classic: UCSUR's 1992 Omnibus Trout Survey and Report. OK, it's dated, but still unreplicated. Whenever I worry that I am getting obsessive I just take a look at that report. 97 pages of single spaced text interspersed with 126 tables. And what I recently found in the files was the technical appendix that went along with that report. I cried. 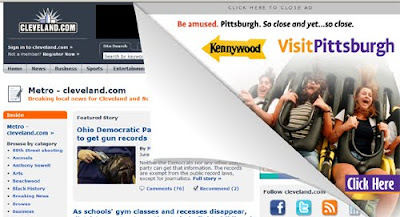 So I like to read the Cleveland news, mostly the Plain-Dealer's Cleveland.com site. Often there are a lot of snippets important to us that don't quite make it to ink down here. What I caught today was a first. While I had seen some airport specific ads from Pittsburgh placed in Cleveland markets last year, for the first time I saw a more general ad trying to entice Clevelanders to come and visit Pittsburgh. Just interesting is all. Not quite sure the theme comes across as it should: "Be amused?" They want Clevelanders to laugh at us? Speaking of Cleveland. Neat idea they have of a tech summit to help nonprofits: Cleveland software firm holding 'tech camp' to help nonprofits with websites. That and they have a lot of Giant Eagle advertisements up there these days it seems. Must feel just like the 'Burgh. We even share baseball misery these days. Note where that story says the Indians fell to 5-21 over the last three years when playing National League teams. Are all 5 of those wins against the Pirates? There are a few Cleveland events that geography prevents us from emulating. If I wasn't going to be out of town I would head up to the Cleveland Tall Ships festival in a few weeks. I think someone should devise a music showdown between our symphony and the always world ranked Cleveland symphony. I'm thinking something like Charlie Daniels and the devil. I bet that would generate tickets sales. The actual opinion from the appeals court on The Billboard is online here with all the painful history summarized. At least the legal history that is.Who would want to read, let alone write, the political history. But look... Lamar has a blog just on digital billboards: http://www.lddblog.com/ Funny they probably aren't going to mention the ruling here. and they map all of their digital billboards. I guess I need to get around reading this book from 2007. But it's the title of this post from the Mises economics blog that caught my attention: Pittsburgh Laughs Last. The book it is talking about: The Cinder Buggy, a fable in iron and steel, which I take is fiction. So I am guessing it's somewhere in the nexus of Ayn Rand meets Valley of Decision? Yet I don't quite get the tone of blog post in itself. It seems to be holding up Pittsburgh as an example of what success Libertarianism can bring. I do realize that must not be what it wants to imply, but it is saying Pittsburgh is this positive example of transformation. So I guess it's one more voice out there trying to take credit for all the success raining down on us. Gone are the days when everyone was more focused on blaming everyone else for the state of the region. Good thing we all work together so well which is part of the secret sauce. Hey, has there been any progress at all in the idea for a Downtown to Oakland transit link that was floated last year? A rhetorical question. Though we do need a name for it. With a dearth of creativity, how about Spine Line II? Or what about the much cheaper, and ever envisioned, Allegheny Valley Railroad (AVRR). Whats up with that? Last news I see without much further followup was this story of legal problems from last December. Few things have been talked about for so long with so little progress as commuter service on the AVRR. The story mentions there were oral arguments in the case which just took place in April, the video record of which is actually online here. (wmv file, AVRR case starts at time 53:00). Transit wonks, or anyone interested in city development efforts in the Strip or thos interested in the AVRR will want to watch most of it. The current legal holdup to the AVRR seems to be that the Buncher Company is itself disputing an easement on a very small piece of land which the railroad would need to make it through the Strip District and become a viable route to Downtown. Buncher is also the developer the city has partnered with and is partnering with on many other projects. Most notably or relevant of late is the project working to redevelop the terminal building also in the Strip District as well as other big riverfront projects in Lawrenceville and the Strip District. How these ventures and the litigation holding up the AVRR interact I do not know, but the issue seems to be the easement the AVRR needs, and which Buncher is disputing is a piece of land all of 15'x90' that is right next to the Terminal Building which Buncher is working to redevelop into a produce market again. Maybe we can just settle for a hand powered monorail here. 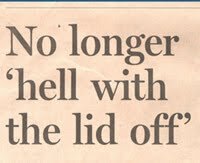 (h/t to a print story in the Financial Times last week). So yeah, that may be what we are left with for transit at the rate we are going. More from the inimitable Data blog from the UK's Guardian is this post with an awful lot of embedded wisdom: Local government data: lessons from London. Those who care about data transparency in government, or just transparency period, should read every line. It's hard to describe just how far we are away from where they are right now. Even when we do appear to make some progress, we really don't. Sometimes we come up with some flashy gizmos to present data, but when it comes to a core infrastructure of data transparency it just isn't part of the culture around here at any level of government nor for any local agency or authority. Sometimes it's a capacity issue; a reflection of our fragmented local government leaving many a small municipality unable to think beyond the most immediate and pressing projects. But that really only explains so much. Plenty of essential data already is being collected and could easily be made available in the most 'ugly' format (see the article from the UK on that) online.. Once data is available, I bet there are plenty of brilliant minds who can find ways to parse it and present it with the best applications we can dream of. We typically do this all the other way around: make the fancy application and never make any progress at getting the underlying data into a public space. I'd go so far to argue that we have collectively gone backwards and that there was more public data available locally a decade or two ago than there is today. Not sure if that rises to the level of a rumor even... more like a desperate plea at this point. I still wonder why nobody even asked what they were talking about on the Steelers tickets. True or not, you would think that is Piergoi level news around here either way. A biz article looking at the Marcellus economic impact: At Drilling sites, business is good. ---- The latest data on mining employment in Pennsylvania. --- Ever more international play with WSJ coverage of big Indian shale investment in Texas. Are we far behind? and out in Eastern Pennsylvania they are now looking toward us for lessons in how to deal with Marcellus: Western PA communities changed by natural gas drilling offer local lessons. Platt's suggests the state severance tax is going to pass. and looks like they finally realized the Mellon Arena moniker is soon to be history as well. Who asked about that? Let's have a contest to rename it. I think Downtown lacks some color. Maybe we can paint the dome gold or something. It would go with the sports motif, or be more Gatsby-like. I know the Pierogi's rehiring makes more news around here, but note the little story about the increasing likelihood that the City of Pittsburgh and the Borough of Wilkinsburg may merge fire departments. It's by far not a new idea, but looks a lot closer to actually happening. So garbage collection is already merged between the two municipalities... if fire happens then what is next? Is it not time to publicly talk about a more complete merger of City and Borough? There, I said it. Dare I even bring this up... but what about the two school districts? Is it really inconceivable that this could be a future map? I just have nothing to say on this one. I mean.. really? There's even criteria that is beyond comment. One of the subcriteria is 'Manly “Kryptonite” Category / Emasculating Criteria'. I mean.. what is there to say about this? Is a silver stake needed to end this story thread? It's not over of course. With this latest legal ruling, does it all just mean this story is really beginning. The billboard in question sits on top of the Grant Street Transportation Center which is mostly a Pittsburgh Parking Authority lot... Does any of this impact the parking lease machinations? Probably not, but everything in this town is connected. In fact I think the seeds of the current dysfunction in city council stems from the acrimony that resulted from the billboard machinations. I had a video on youtube of when Doug Shields and several other councilors walked out as president and left Motznik in charge one day...Remember that? One of the more entertaining snippets on Grant Street that year. but it was over 10 minutes and the Youtube gnomes have censored it for length. No, it's not that we are the #1 least likely place to experience an earthquake...thought that is what Mr. Feed says. But Forbes has us (haven't we been through this enough times?) the single most affordable place to buy a home. Really... #1 even. A veritable investment they say. I hope everyone realizes what an accomplishment it will be when we no longer make that list. But if we are really #1 right now, we have a long long way to go. Seriously, if I get a quick 100% appreciation in my home I'm retiring to Bermuda where I can blog safely without any risk of an earthquake getting me. 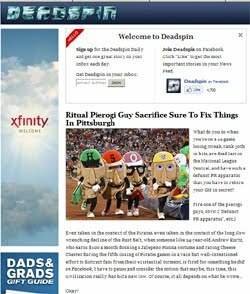 Just call this the most eclectic blog in the 'Burgh. News of an earthquake felt in Pennsylvania today. We have covered the non-zero Earthquake Risk in Pennsylvania in previous posts. A low probability event for sure..... but lots of low probability events in the news these days. That long tail is out there. Just to finish up news on the latest batch of municipal population estimates that are in the minor news cycle. My only comment to that as it relates to the city's latest population is again that the revisions to last year's population estimate are about the same magnitude as the estimated change in population over the last year. Should take that as a lesson as to how much to interpret from these numbers in themselves. Here is a quick and dirty map of what the data shows across the county. Again, take with a grain of salt as to what it actually says about population change, but the the data does probably reflect pretty well residential housing construction across municipalities. The colors do exaggerate the changes especially for where there was 'decline'. For the most part the actual numbers are quite small up or down in both absolute and percentage terms. I thought any other more detailed shading would imply overinterpretation. So a very broad measure of where housing activity is relatively stronger within the county is what this is for the most part. No surprises, but that may be a surprise in itself. That the general pattern is mostly the same as every other year for last 50 is something. 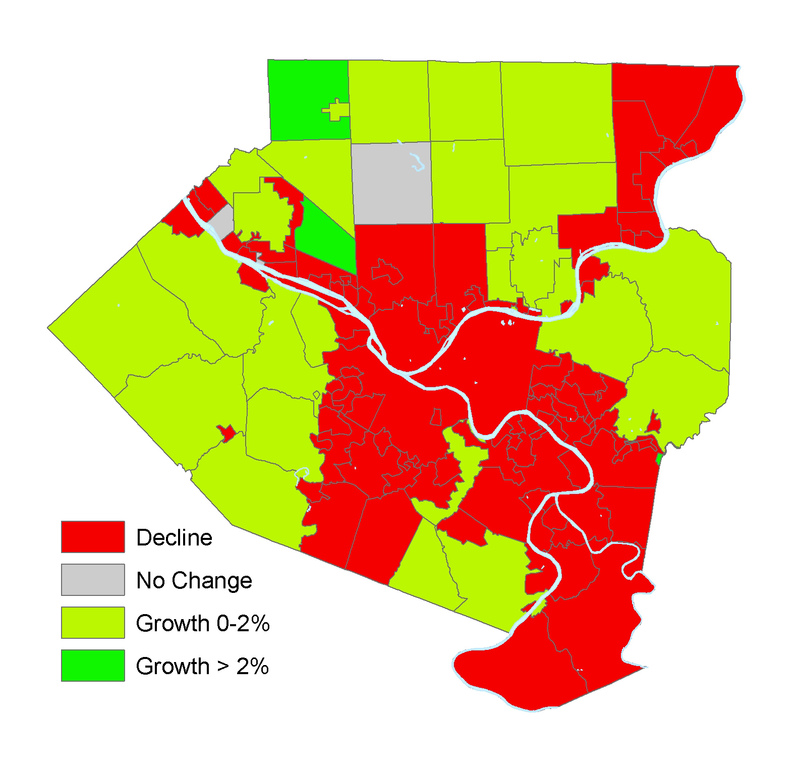 Some of the South Hills suburbs look to be at least temporarily out of the growth crescent that has defined change within Allegheny County for decades is about all I note. That some munis have maintained building activity through depth of a very housing-focused recession is something in itself. Anyway, this is all data you can look at directly from the census here. New city of Pittsburgh population estimates are out. The only slightly interesting thing is that there was some revision of past numbers upward. So last year the 2008 city population was estimated at 310,037, but now is estimated to be 312,119. Without the revision the numbers would have appeard to show an increase if the 2009 estimate stayed at 311,647. So 1,600 or so folks have appeared from the ether which I suspect is in part a revision in group quarters population and increasing college enrollments locally. Revisions seem to say that there was virtually no decline in population between 2007 and 2008. But as I said, all are estimates and I bet there will be more than a few surprises next year. With news of a home sliding down a hill on the North Side, I'll ask again what I asked last year, but does the City of Pittsburgh Hillsides Committee still function? and let's see, everyone is now realizing this whole Marcellus thing might extend to drilling in the density part of the city proper. It was pretty clear this was all in process last year as well if not long before. I think I had my first shale-related solicitation the previous spring even. From Texas is some advice specifically for neighborhoods on Gas Drilling 101. What is up with the Google Fibre competition I wonder?? Just came to mind as I caught a 'daily ranking' entry even thought it's from last month. Did anyone catch this ranking that has Pittsburgh #3 in terms of having the fastest broadband. City controller has a report on EMS funding and its future. I am generally not a fan of increasing government fragmentation, but I will repeat my suggestion that it might be a good idea to create a Hospital Authority to manage EMS services for the city and possibly (by that I mean voluntarily) environs with a formalized role from the big health care systems in town. No soup parking study for you is the news on Grant Street. I kind of wonder how much the potential bidders have invested in research and analysis leading up to the proposals that are about to come in. I bet before they spend $300 million or so they have spent more than $250K in legal fees alone, let alone research and other due dilligence. The result is what would be a classic case of asymmetric information between buyer and seller, though it typically works the other way around. Not really news, but on all things parking. I used a Pittsburgh Parking Authority lot over the weekend and was about to put money into the machine when a local let me know that "they" never ticket on a Sunday. So I observed quickly that it did appear true that no cars in the lot had paid so I concluded he was correct even though the signage said enforcement was 24/7. I just wonder how long that, or any other special arrangements I am aware of with regard to parking enforcement, will last once the lots are 'monetized'. and I'll just roll this into here... but with ever more Civic Arena ever more on folks mind it might be worth looking at what options they are still exploring for the Astrodome in Houston. 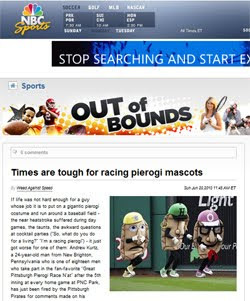 and ever more Pierogi coverage from the Philadelphia Inquirer, Fanhouse, and WXXA in Albany of all places. I'm waiting for the Pierogi to get on the talk show circuit soon. For those who read story today talking about some population projections for the county... the story was mostly an update to a story written 3 years ago and is worth (re)reading for the perspective. What close readers caught in the story today was that we expect to see the latest (2009) population estimate for the CITY of Pittsburgh tomorrow. We have already learned what the estimated population is for the state, MSA and county are for 2009... but folks want to know what is the comparable number for the city proper. Should be the last big thing we care about before we learn the 2010 census population counts are released. Should always know your data and municipal level population estimates are a big case in point. Nobody is out there counting the number of people who live in the city each year. The census comes up with an estimate based on various levels of modeling... A far cry from actually counting people and no doubt there will be surprises when we learn better numbers from the 2010 census when they come out next year. So the city's population, along with the population of all other individual municipalities in the state are really slices of the county population estimates we already know. How is the county population divided up? A bit simplified, but basically it mostly comes down to building permits issued. Why? Well, folks have to live somewhere to begin with. There is also a big issue of working with what data you have and the data on buildng permits is one of the few consistent metrics at a municipal level that can be used to impute population trends. So what to expect. The big news of late is that Allegheny County's population in 2009 was a whopping 434 people.. something just over 0.03%. Will the city's estimated population go up as well and appear to stop what has likely been a 60 year or more decline? Below is a summary of what the building permits data are for Allegheny County and the City proper annually since 2000. These are the total estimated housing units covered by issued building permits. No guarantee they were all built, but it's a start. I see at least 3 different stories in that one table. One story is just how low the total number of new houing units expected in either city or county in any year. These are not big numbers compared to places that have seen growith in recent years or decades. Thus one of the reasons that parts of the region have some of the oldest housing stocks in the nation. 2nd story is the trend, which reflects the housing crisis in part, but a downward trend for the county since 2006. Finally the building permits in the city remain virtually anemic as they have been for a long long time. We hear a lot about some new developments... but for a city our size the number of new housing units is low and low in proportion ot the share of the county's population. City is roughly a quarter of the county's population, but as you see from the table, typically accounts for less than 10% of all new housing units to be built.. When you account for demolitions, let alone de-facto abandonment, we must have a net decline in functional housing units in the city proper. Soo.. if you follow the logic, the county's gain in population does not necessarily mean there will be much growth in the city.. The low % city housing units means more of the growth in the county will be elsewhere within the county.... but we will see in the morning. The story may be that the city's population is still declining (per the estimates to come out) but it is likely at a slower rate of decline than in recent years. Lots of other things going on even... we really won't have a great idea what the populations are of local municipalities until next spring. So take this all with a grain of salt. In the city and region there are other things that will impact current and future population. Lots more college students living in the city of late. College students impact population forecasts very differently than the household population. One way or another households are really paying the taxes and the household population of the city of Pittsburgh is clearly as low as it has been in a long long time. I think the front office folks are as good at public relations as they are at managing a baseball team..... You see what news this is generating. 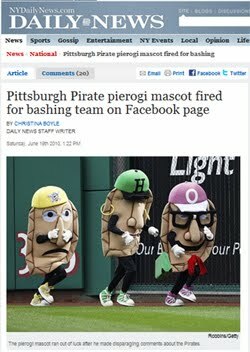 They could have waited a bit before axing the poor pierogi.. Could have gotten rid of them all at once even, I'm sure their terms were all expired or something like that. Why make it look like it's retaliation unless you had to? 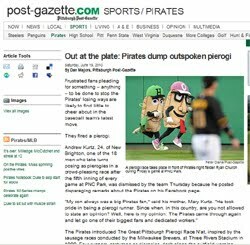 In the end it might be the pierogi that shames them into doing something productive on the field. 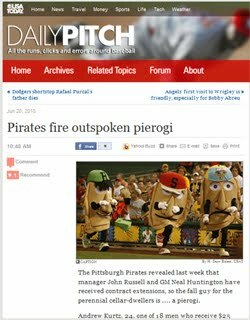 Would make it the pierogi that saved Pittsburgh. The Cleveland Plain Dealer is reporting that visitors to its web site Cleveland.com are up 50% over the last year. What are the comparable local numbers I wonder? I've always found it interesting that pittsburgh.com isn't used in itself, but redirects to station WPXI. I wonder if that is the best branding tactic? Call me a fair weather fan, but I can really only tolerate a single Pirates game a year these days. Thus I suffered through the Pirates' loss to Cleveland last night. The playoffs bound Indians of 2007? Nope, Cleveland has the 3rd worst record in all of MLB these days, ahead of Baltimore and... well.... you know. I think I was rooting for Cleveland deep down. One win won't help the Pirates much, but losing there is at least an outside chance at some sort of record for most losses in succession, or cumulatively. Yet despite all that.. still there were a lot of people out at the game. Kind of makes you wonder how well they would do if say they did the unthinkable and threaten us with breaking even on the year. What else do I notice? For most of an inning or more the advertisment running on the scoreboard was for Greer Limestone?? Who is that I wonder? and I wonder if anyone at the game wondered as well. Largest limestone operation in West Virginia it turns out. So a regionalism story I suppose. I am sure a solid upstanding firm, but how many itinerant baseball fans are in the market for mass quantities of limestone? Maybe they are owned by the Nuttings'? So bad it all is that the organization now has ousted the frustrated pierogi. If you are venting on the pierogi I really don't think there is anyone left to blame is there? Hard to see how this won't be a PR fiasco for them in the end. 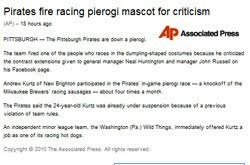 Who in the world is anti-pierogi? Stop reading. Seriously, a great day like this... I will be disappointed if today does not have the lowest hit count all year. Go find that bike buried in your basement. Take it over to Kraynick's... Argue with Jerry to tune it up; he'll try and get you to do it yourself there in the shop with his help and tools. Go bike along the rivers. It's hot, so make use of the overhead misters along the trail Downtown. Don't forget, there is some construction closing a small part of it. Build up some miles for the longer trip you will be doing. Read some of the contemporaneous coverage of his ride in 1892.
and can you believe that the Wikipedia entry for Frank Lenz only comes up with this article. We seriously need to fix that. You know, there used to be news coverage of the steel industry here. This would have been big news in the past. The other day there was a major Canadian court ruling against US Steel stemming from a decision to shrink employment and output at a plant in Hamilton. Has to do with us as well since through the recession US Steel actually was consolidating a lot of their output at the local Edgar Thompson plant. If it was in the news I missed it... maybe there was wire coverage in print, but still. Development efforts in the Hill District are likely to make ever more news in coming months. A corresponding news thread of folks debating what will be the fate of the Civic Arena is also coming to a head at the same time. Between the two topics (which are the same topic of course) you can see the spate of recent stories is just the beginning. My one observation is that the folks debating the two topics don't seem to talk to each other at all, don't seem to have much overlap in names and really are just talking past each other. This all will be painful. Will be.... is.... has been... Will we ever get to will have been? Here is the New York Times has on November 17, 1947. Not a typo, the date is 1947. You could have a discussion over what just about each line says. So we will just start with the transcript, but I would almost read it backwards. PITTSBURGH, Nov. 8 - A multimillion-dollar civic center eliminating seventy acres of substandard housing from the Pittsburgh business district has come from the drawing boards of two Pittsburgh architects. Known as "The Pittsburgh Center," it was designed at the request of the Pittsburgh Regional Planning Association and turned over to the Pittsburgh Chamber of Commerce for practical application.If ever carried out, it would provide this steel center of the world with much-needed improvements. The plan includes a huge arena, seating 18,000 for sports events and 15,000 for conventions. a hotel, apartments and a crosstown highway. Financing for the crosstown highway lias been assured by, Allegheny County authorities, while the city's share of property damages was included in a recently approved improvement bond issue. The. highway would bisect the outer edge of the business district and parallel the southern end of the Pittsburgh Center. The center would be constructed on a n,uge section of what is known as The Hill, now partly covered with slums. The civic center would rip out homes and apartments in which 1,995 families now reside, and would 'provide apartments for 2,000 families, plus wide streets, parks and modern schools. I should add of course that 1947 was surely not the beginning of any of this. One of the first posts here: Seeds of Our (self) Destruction, points out what may be the real genesis of what happened in the Lower Hill District and environs. 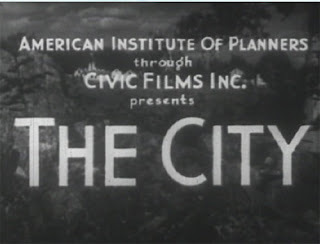 A film I would use when teaching urban economics is a documentary entitled The City (American Institute of Planners, 1939, available as an MPEG stream via the Prelinger Archives). One of the more remarkable films ever made. I believe as do others that 40 years of anti-urban policy all stem from... if not that film in and of itself, then from the mentality that inspired it. For all intents and purposes, Pittsburgh was its case study. From St. Louis is more on what former mayor Tom Murphy had to say down there at a meeting of the Partnership for Downtown St. Louis. The St. Louis goal: to be the next buzz city. (like Pittsburgh is implied?) Some interesting snippets from the first author who starts out by saying she is from Pittsburgh and says it is "weird to see the city hailed as a model for urban revitalization". Sort of sums up the ubiquitous yinzer cognitive dissonance that is out there. Not just out there of course.. lots of local folks share her sentiment. Pittsburgh? A model for anything? and video even.. or a still of a video at least. Hey, I wonder where he got that factoid on educational attainment? Note also a bit of contradiction. The theme is St. Louis should be like Pittsburgh and also that venture capital is important. Note the mention in passing of the story we don't talk about as much as we should... of how the local founder of Genentech, Herb Boyer, could not find local venture capital and so wound up founding the worlds largest biotech company elsewhere. So are we good at this venture capital thing or not? All depends. Nonetheless, I still find it odd that the guy who can't get a bike path named for him locally has a full speaking schedule just about everywhere else in the country and beyond. "inadequate content"? : A small, but maybe not so small, article from the FT on the latest potential evolution in media's reinvention: Google casts shadow over new media groups. It says google has patented a method where search queries are matched to news coverage to figure out what folks are looking for and not finding. There is a joke in that, but I can't quite compose it. If you are interested in anything Marcellus, note the WSJ story on the doings in the actual market for natural gas: Mystery in Natural-Gas Markets. and on Marcellus stuff... is anyone at all doing something like this around here? Just a random PR that got caught in the news filter about a downtown real estate investment.. and I would ignore PR's normally, but does this say anything about the Downtown real estate market?.... If nothing else, it's still a feat that someone is touting their Pittsburgh investment. Can't believe I missed this. National Geographic Magazine's June issue uses Pittsburgh as an example looking at some energy metrics and commuting. See: One Day in Pittsburgh. Click through the link to see their graphic. There is this bizarre disconnect out there isn't there? BP-induced oil phobia growing... greater 'green' talk all around. I bet eco-consciousness (whatever that really means) is higher than in a long time. Yet the thing that may have the biggest impact on oil usage, that would be your mode of commuting, people don't really care much about what is really happening to the things that actually do conserve energy. Note how the National Geographic "eco friendly" commuting patterns for us supposes a +40% increase in transit usage for Pittsburgh. Yet there is virtually no public reaction to the announcement that the Port Authority may soon cut routes by 30%. In fact, given the limited footprint of the AC Port Authority within the greater region, coupled with the minimal transit options once you are outside of Allegheny County, how is it even conceivable you could really bump up transit usage by 40% in less than a generation (or $6/gallon gas I suppose). So +40% in some conjectured world of National Geographic, but -30% a real possibility on the ground. That's quite a difference in and of itself. Worse than that by far when you think about it. The routes and ridership the Port Authority will lose will inevitably be its longer routes and longer distance riders... So the commuting by auto that will take the place of those routes are proportionally much larger generators of new demand for fuel than the routes the Port Authority is likely to save which are the shorter routes, and the shorter-distance passengers closer in to the city. It's hard for me to watch any news or commentary on any of this... it all makes so little sense from just a pure consistency point of view. Pro-transit or anti-transit or whatever your thoughts are is up to you... But most seem to want to have their cake and eat it too... thinking they are doing ever more environmentally friendly things, but leaving transit to consolidate into dysfunction. Consider that most 'green' initiatives you can do on your own are likely obviated by commuting by car vice almost any other alternative. At the end of the day... the trends for transit usage are all down and if that bothers you there isn't anyone really to blame other than ourselves. To borrow a headline: We've met the enemy, and it is us. Anyone remember the experiment the NFL had many years ago with regular season football games broadcast entirely without commentators? The video had all the normal 'heads-up' type information on the status of the game: score, down, distance, etc, etc, but there was no Bob Trumpy to tell you what it all meant. Didn't last long, and local games would always have local analysts... or we would just listen to Cope on the radio. It came to mind because I was thinking that I will experiment here and put this up entirely without comment on it. 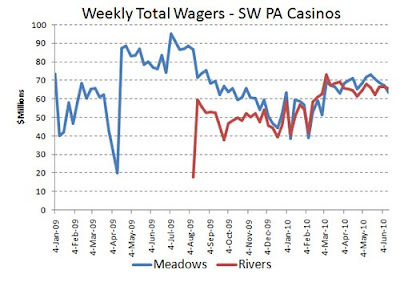 The data behind this figure is online here, but this is the trend in total weekly wagering at the two local casinos since the beginning of 2009. What is there to say? or not say. for hockey wonks? via flowing data is this interactive graphic from Robby Macdonell visualizing NHL Stanley Cup winners and losers since 1927. Teams are shown up top and years are on the bottom. Mouse over a team and connecting lines show past appearances if you are looking at a team, or the winner and loser, if you are looking at a year. Seemingly a small bit of news on the latest developments on the CityVista project that was going to be in both parts of the City's Chicken Hill neighborhood and Greentree.. Remember CityVista? It was making a fair bit of news as some residents opposed the plan and they even had gone to the web with the making of a very entertaining, if odd, youtube video that caught people's attention. Odd in that it was all played out with a 'anti new urbanism' theme even though I am not sure there was much new urbanism in it to begin with.. and the anti-new urbanists were labeling themselves as "small town america" even though they were technically the urban city dwellers in the story. One of those 'only in Pittsburgh' kind of things. The story and links were in this old post. Looks like that in response to resident opposition they cut the development roughly in half and took out all parts within the city proper. Gotta think about that some. Probably a bigger story than it seems in the big picture. Repeat after me: comprehensive plan. If only I had time.. I really need to do this for Pittsburgh. See this detailed interactive map graphic Forbes has just put up of migration data for major metros in the nation. Most have seen it, but our latest report based on the same data that underlies that graphic is online here just fyi. Same stuff, just not as neat a presentation. oh... half nevermind.. It isn't just for those major metros listed.. You can do it for all counties if you poke at it.. But I guess it's only compiled by metro for a few areas. Someone really didn't get the memo... and the someone is not your run of the mill talking head... Read about the recent comments by retiring University of Washington President, and incoming NCAA president Mark Emmert. You can find the context for the Pittsburgh references yourself.. the key sentence is where he declares Washington State "might just end up like Pittsburgh". I suppose he could have meant that in a nice way, like that was their goal..... not! It was more like an ominous warning. So do we mail him some glossy promotional material to get him to change his mind? I say we invite the guy here and see what he has to say. Would be good for both him and us I am pretty sure. 2nd best grouping that is. Brookings has a report just out: Tracking Economic Recession and Recovery in the 21 Largest Metropolitan Areas of the Great Lakes Region. Pittsburgh is in the group of metros performing well, but not the best, through this recession. The Brookings Great Lakes Economic Initiative (GLEI) is a relatively new thing. Not new new and dates from 2005. But there was an active Great Lakes Economic Development (GLED) association of researchers founded in 1987. One of the last of GLED's annual conferences was even in Pittsburgh in 2001 I think it was. One of the reasons GLED lost steam was that the similarities in the experiences of Great Lakes metros were diverging by the end of the 1990's and it became harder to talk about the Great Lakes region collectively. Obviously some folks think it makes sense to continue to address some issues across such a broad area. I think that's right, but it still is a different construct than the mid 1980's which was a time that Great Lakes was much more a synonym for Rust Belt and the problems across Great Lakes regions were more correlated and ubiquitous. What's interesting these days may be as much what is different between those regions as much as what is the same. You know.. I probably could generate a ranking a day if I tried. It would be impressive if we could do it all from 3rd party sources. The Milwaukee Journal Sentinel has several Pittsburgh comparisons in an analytic piece poking at the nexus of talent, educational attainment and city growth: Does Milwaukee have enough college graduates to thrive? Mr. Feed uses that as a foil to connect it to some of the broader talent debates ongoing. We of course have been talking about this a bunch of late. Also and related, I am not sure the table below will insert correctly. But catching up with a bit of news last week on some census estimates that just came out. These are the latest estimates of the county's population by age range. It's the age range breakdown that is new.. we had the top line numbers reported a few months ago. The raw data for this comes via here... and the following is my quick extract from that data for the county and the MSA. Again, these are estimated breakdowns of estimated data all controlled for a population base set in the 2000 decennial census... so 9 years prior to the latest 2009 estimates. Which all means you should parse in detail only with a grain of salt. But still some trends you can think about and at least keep an eye on.. and we will learn next year whether they are consistent with what the 2010 decennial census tells us. Toledo Blade of all sources has a focused look at the structure of Allegheny County government today. Ends with an interesting statement worth thinking about. ACE says that Allegheny county voters would vote again to change the structure of government here from a 3 commissioner system to the powerful chief executive system we now have. Mr. Onorato said he's convinced the voters would not go back to the three-commissioner system. "For all the growing pains, it's a much better form of government," he said. "They've seen the results of it. They like the new form of government. It actually works. It works very well." People have forgotten the fundamental switch in county government happened just over a decade ago when the county had a referendum on a new county charter. What is completely forgotten is that the home rule charter vote passed by the slimmest of margins, it just slipped by in a virtually 50-50 vote. Yet why did it pass? The previous attempt just a decade or so earlier had strong bipartisan support by the most popular local officials of both parties. Yet failed. Was their a growing Republican base in the county, or decreasing Democratic support, that lead to the change? The first election for an ACE in 2000 did indeed elect Jim Roddey, which people also forget was only by a very slim margin over the always controversial Cyril Wecht. But Jim Roddey was only a one-term politican and would lose to Onorato the first time up for re-election. But Jim Roddey's election was not the point at which Republicans regained control of county government. 4 years earlier Larry Dunn and Bob Cranmer, both Republicans at least at the time, gained a majority among county commissioners and effectively took control. One could make a strong case that the public's antipathy toward how badly county government was run in the years beginning with that 1996 election is really what made the difference between 50-50 vote for the charter and a 50-50 vote that comes out just against the charter. I still think Larry Dunn is the single most important person responsible for the passage of the county home rule charter. What does it all mean? The law of unintended consequences is always in play. Democrats who likely were more against the change in local government structure may be the ultimate winners. With less party infighting than there was a decade ago and before, coupled with selective migration that has left the county more leaning D over time, the switch to a simple strong ACE leaves R with less influence in county government than ever before.. The PWSA is looking for a solution to persistent billing problems. So it has decided to ditch its SAP billing software and spend millions on another billing software. Who is SAP? Maybe the largest business software company in the world. Must be a lot of people having billing problems around the globe. An international hydropecuniary disaster? (wait, that description probably better applies to something else going on these days) The new company is probably one that has never had problems implementing software for local governments. Really, never. I personally liked the Malaysia answer better. Shows creativity if nothing else. I can't resist. The new software company: 46 employees. The old company: ~50,000. Obligatory mention of what one of the news filters caught from St. Louis, though I'm not surprised Jim R. saw it as well. Long way to go to find the answer to that... You would think someone would have the answer around here and save us the trip. There is also a new and growing cottage industry of people claiming to have answers to that question. I'll lay odds that Shawn and Tom don't have the same answer either. Which one is correct? Could it be both? or is it neither? Does it matter? Bloomberg (née Businessweek) yesterday came out with a list having us #4 in terms of the most improved U.S. housing markets. Something to read along with that is an interview running today in the PG with Hoddy Hanna on the state of real estate markets locally. I don't quite get the Bloomberg logic. Most improved implies things have gotten better after being down. As their own text says, the housing market story here is more one of stability which is different from actually 'improving'. Whatever. The master list-maker in the sky says Pittsburgh has to be on all positive lists these days so why knock it. Also to go along with that story is some economic commentary from Ezra Klein in the WashPo: The Housing Crash and Long-term unemployment. There is actually a diasporan note in one of the comments left there if you want to look. It actually is awfully telling as to explaining some things going on with regards to Pittsburgh and migration these days. So on unemployment... and the Bloomberg article above which references us as "Despite having a high unemployment rate".. I don't think I commented on the last batch of local labor force data. 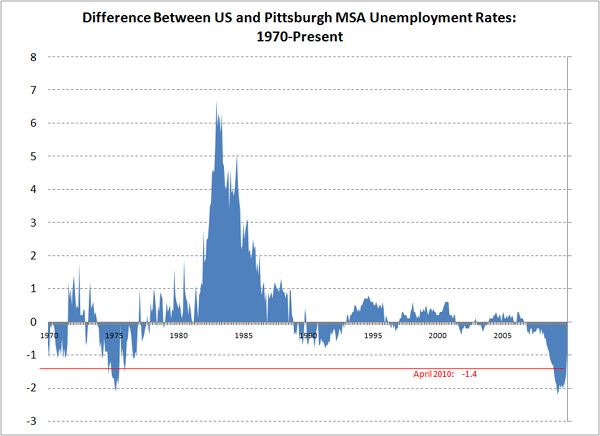 So here is just an updated version of the Pgh v. US unemployment chart. 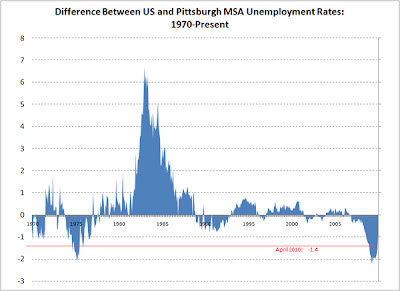 Bottom line it has been 43 months since the US unemployment rate was actually lower than Pittsburgh's. An unprecedented duration for that being true for us. and finally. Astute news readers may have caught that there is some new census data out. Maybe some parsing on that later today. I know I am way ahead of the curve pointing this out..... and it does not yet have as many twitter followers as say Delano does these days.... and but if you have not been following the alternative BP twitter feed: http://twitter.com/BPGlobalPR you reall need to. You feel guilty laughing so much since its raison d'être makes you cry. Does anyone know who is really behind all that? I see this little bit of meta coverage on it in PCworld today. Where is Conan these days I wonder?